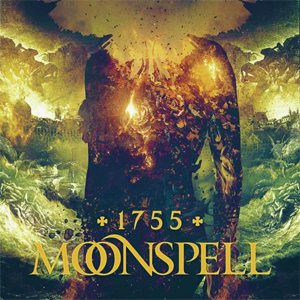 Portugal's Dark Metal pioneers in MOONSPELL are finally back with a brand new album, titled 1755. The album will be released on November 3rd 2017 on Napalm Records, this record will outclass all standards you have ever heard from MOONSPELL before! From the first second the conceptual dramaturgy MOONSPELL have created feels like a detonation of the mind. 1755 is more than just the band's new magnum opus: It's the musical version of the year of horror where a giant earthquake wrecked their home Lisbon. Naturally this album comes and is sung in Portuguese. The album, produced by Tue Madsen also features Paulo Bragança, supplying a hauntingly voice of a Fado fallen angel who is a big part of the Portuguese culture. His fascinating vocals are featured in "In Tremor Dei" (eng. : "Fear Of God"). Now the band fronted by the soul of dark art and visionary Fernando Ribeiro unveiled first details about 1755 and unleash the stunning cover artwork as well as the album track list! "I have been fascinated with Portuguese history since I can remember. The year of 1755 marked the birth of a new Portugal. Much more than just the greatest natural disaster ever to occur on European soil, the great Lisbon Quake, shockwaves can not be reduced to a dramatic death toll. From absolute tragedy, a new city was born, giving way to a new time where Portuguese relied more on themselves than on the crown or the cross, granting us, much of the city, the lay country, the free will that we enjoy today. This is not just another album from us. It's a musical and lyrical History document, a homage we pay to our legacy and to the amazing skills and resilience of our fellow Portuguese back then, of all mankind when brought down to the knees by the violent forces of Nature and Reason. Whatever is, is right... yet the earth shakes." 1755 is a dark adventure in medieval landscapes - emotionally, technically and completely earthshaking! The album will be available for pre-order soon.